Posted on กุมภาพันธ์ 9, 2016 by adminmin Posted in แมลงทอดไฮโซ	. Bugs have been eaten for centuries. Grasshoppers, caterpillars and even ants’ eggs _ the “caviar of Insect Snack ” _ have long been local delicacies. But the rising popularity of insects as commercial food is putting a burden on the environment. Insect harvesting can lead to deforestation, but villagers in Chiang Mai have found a way to catch caterpillars sustainably. Probably the best example is rot duan, or fried bamboo caterpillars, a famous snack which has become a popular souvenir from northern provinces. Rising demand for rot duan (its nickname, describing the bug’s train-carriage shape) has driven catchers to cut down swathes of bamboo forest in Chiang Mai and other areas. It’s a highly lucrative activity: raw arthropods such as caterpillars can fetch 500-1,000 baht for a villager and when sold as snacks can rake in up to 1,500 baht per kilo. Yet some villagers have become aware of the environmental impact. Karen villagers in Ban Mae Yangsan in Chiang Mai’s Mae Cham district have come up with a conservation method to prevent deforestation caused by insect harvesting. Like many villages in the North, Ban Mae Yangsan is a habitat for bamboo caterpillars and villagers earn extra money by catching them and selling them at the market. Deforestation has become a serious problem as bamboo forests were cut down to collect edible insects. Supported by the Thailand Research Fund since 2004, villagers have found ways to harvest insects sustainably. They studied the life cycle of bamboo caterpillars and their habitat, then laid down harvesting rules. 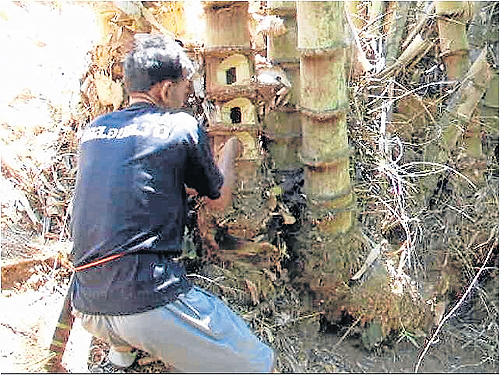 Instead of cutting down bamboo stalks just for a handful of caterpillar larvae, villagers now only cut the part of the bamboo where the larvae are found. And to prevent over-harvesting, only mature caterpillars can be taken. This is just a small and isolated case of the sustainable harvesting of insects. “What we need is knowledge of sustainable harvesting,” said Assoc Prof Yupa Hanboonsong, an entomologist from Khon Kaen University. According to Prof Yupa, insects are not an endangered species. “There is an abundance of insects in the world. Remember that humans have eaten them for hundreds, probably thousands of years. If eating insects caused extinction, these insects would have disappeared a long time ago,” she said. There are more than 1,900 edible insect species, and 40 tonnes of insects to every human, according to the UN’s Food and Agriculture Organisation. The real concern is the way they are harvested. Most edible insects are found in forests and removing them from their habitat can have an ecological impact. Although there are commercial cricket farms in Thailand and tarantulas are farmed in Cambodia, only a few types of arthropods can be bred in captivity. In Thailand, there are only house cricket farms and palm weevil farms _ a small fraction of the 200 species of edible insects here. Unsustainable catching can affect the environment, such as deforestation caused by bamboo caterpillar catchers. Bamboo forests in Thailand and other countries in Southeast Asia are being threatened by the unchecked harvesting of bamboo caterpillars, said Prof Yupa. Tags: Bug Food, Edible Insect, Insect, Smart Snack, แมลงทอดตราไฮโซ	.